Rick's Pocono Blog: 150 Lakes, 18 Waterfalls, and 170 Miles of River in the Poconos! 150 Lakes, 18 Waterfalls, and 170 Miles of River in the Poconos! Whether you are a Fisherman, Sailor, Photographer, Site-Seer, or Simply Love to just sit by the water and breathe in the Fresh Air of Earth's Natural Habitat, there is a place by the lake just for you. There is simply Water everywhere in the Poconos! Most of the State Parks in the Poconos come equipped with a Beautiful Flowing Stream, Creek, Lake, River, or a Certain Body of Water that brings an Earthy and Special Feeling to that area. There are well over a dozen 'Lake Communities' on the Mountain that have Beautiful Lakefront Homes Available. Simply step out your back door and Fullfill your Lake Experience. Most Communities allow Boats, Canoes, and Fishing on the Lakes. Also, Swimming is Available! Lakes in the Perfect Pocono Mountain Communities are on Wonderful Sandy Beaches where you can take a dip in the Lake! 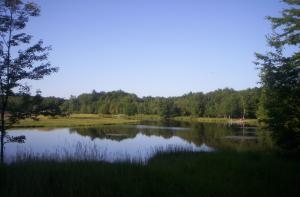 Arrowhead Lakes Community has 2 Large Lakes (260 & 90 Acre), 4 Beaches, and 3 Heated Swimming Pools! The Pocono Mountains is full of The Earth's Natural Habitat boasting 150 Lakes, 18 Waterfalls, 170 Miles of River, and The Deleware Watergap Recreation Area. Is there really anywhere else to be this Spring Season? !